Each year, many specialized media and websites draw up a list of the best engineering schools in France. 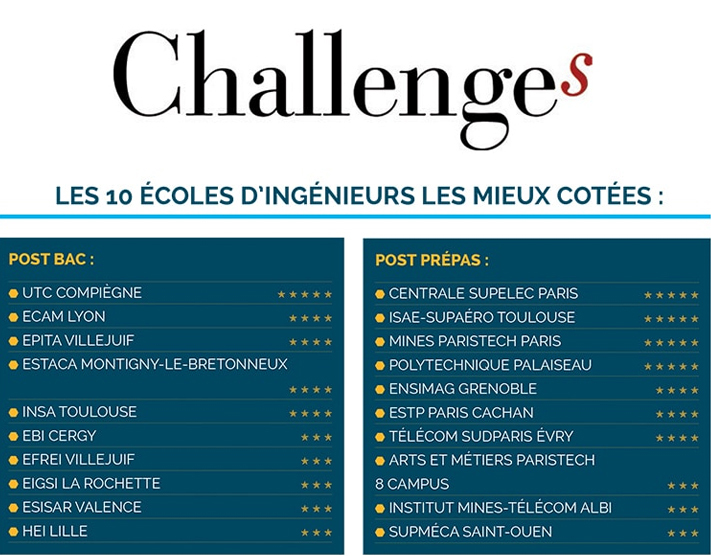 In December 2018, the new list of rankings published by “Challenges” and L’Etudiant once again shows that the computer engineering program at EPITA is considered as one of the best. 2018 Engineering school rankings published by the Challenges magazine: EPITA, a 4-star school! Already given 4 stars in 2017-2018, the highest ranking possible, EPITA was awarded the same symbol of success by the business magazine this year. EPITA is one of the 10 highest ranked engineering schools and is number one in private post-baccalaureate engineering schools in France based on four major criteria: percentage of graduates who receive honors (“good” and “very good”), salary after graduation, amount of time spent abroad as part of the school curriculum and tuition costs. 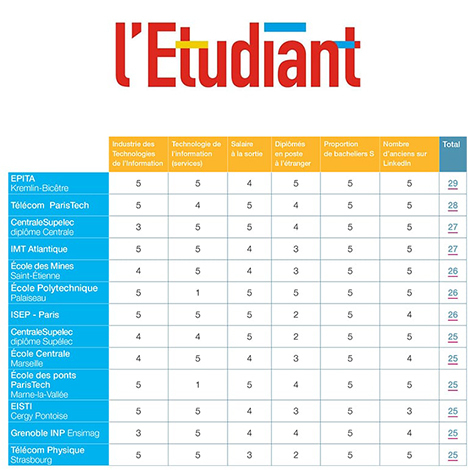 L’Etudiant ranking: EPITA is still at the top! With 17 % of the 2017 EPITA graduates working in the ICT industries, 30 % in services and 21 % in consultancy, the school once again demonstrates its ability to train engineers who are able to meet the needs of the top companies in the digital sector, from major players to innovative startups. At EPITA, the average starting salary is one of the highest among engineering school graduates and continues to rise each year. The majority of EPITA graduates are hired before leaving school or, at the latest, within 2 months after beginning their job search, boasting an average annual salary of €42,800 in France and €66,800 abroad (including bonuses). With a curriculum that places emphasis on international experience, thanks to its many partnerships, EPITA students tend to enjoy traveling, even after receiving their engineering diplomas. 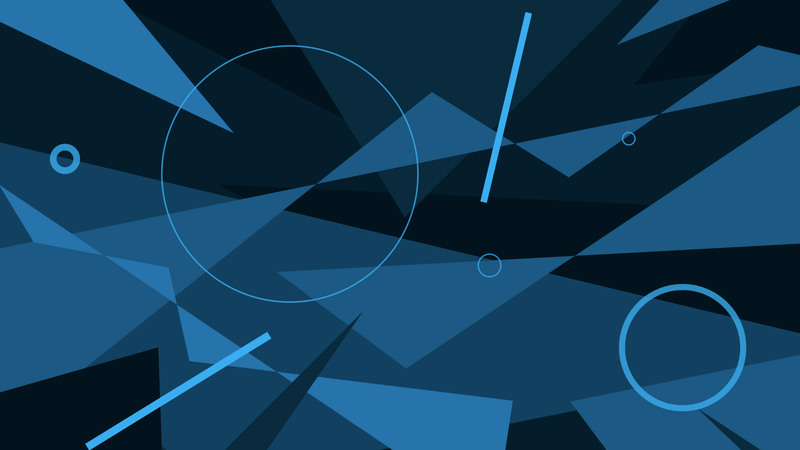 Hence, with nearly 30% of young graduates working abroad for their first job, EPITA has become a well-respected name in Silicon Valley (Google, Facebook, VMWare…)! Boasting an integrated preparatory cycle with a high scientific level, EPITA mainly admits students holding a science baccalaureate: i.e. 95 % of new students who begin their 1st year of studies at the school. 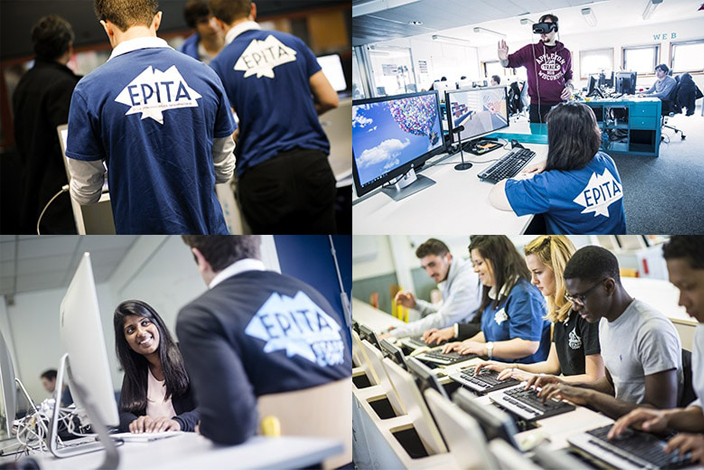 The years spent at EPITA not only lead to a successful career, they bring together a class of students thanks to a unique state of mind that continues to grow well after graduation. EPITA really stands out on the criterion concerning the number of Alumni enrolled in 2018 on the school’s LinkedIn page. With its graduates working in more than 2,000 companies in over 40 countries and thanks to its Alumni association, EPITA enjoys a very strong and dynamic network of former students.